Seventh grade teacher, Mrs. Kim Petro submitted a funding request in support of the 7th grade field trip to I Fly in King of Prussia. The Foundation Board approved the request in the amount of $3,850, which paid half of the entry fee for each of the 140 students. The students attended this trip in May. Trained and reviewed STEAM educators guided the students through interactive presentations, demos in wind tunnels and grade appropriate lab activities. 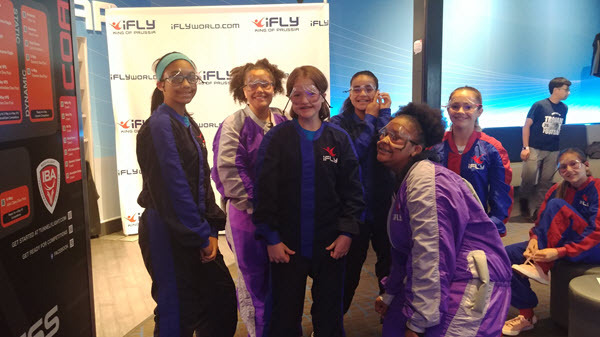 Each trip comprised of an in-depth flight training and flight experience, interactive “physics of flight” presentation on real world application of STEAM with wind tunnels, vertical wind tunnel ball flight testing, and hands on creative student experiments. The students also helped raise money for the trip by hosting a dance.